How to manage one’s intake and outflow of nutritional energy in an age of abundance is a vexing problem for much of the world. So much bad science has been conducted on this problem and so much bad advice has been given, that it is difficult to know what to believe. After experimenting and reading many articles and books on nutrition, here is what I have come to believe. The body is an open energy system. What this means is that energy that comes in must equal energy going out. Excess energy is conserved and stored as fat. Any argument about eating as much as you want because the food ingested is “special” in some way is bogus. Nutritionally, the body needs fats, carbohydrates and proteins to function. The best diet strategy is to avoid fad diets and to exercise portion control, which limits caloric intake. The only types of food to minimize in the diet are those that are highly processed and filled with preservatives. Highly processed foods are low in micro-nutrients and fiber which help fine tune the fitness system. They also have a higher probability of introducing contaminants, which could mutate genes in healthy cells into cancerous causing genes. For men maintaining a waist size of 35 and under; and for females a waist size 29 and under are sensible targets for controlling obesity. A sound nutritional program and a rigorous and consistent fitness effort will achieve this objective. A single method of controlling caloric intake will not work for everyone. My program started many years ago when I became a vegetarian. Even though I had an active workout schedule, I still had difficulty controlling 10-15 pounds of excess fat. I have since found another reason for intermittent fasting. Life extension. Research in animals consistently shows that a calorie restricted (CR) diet of about 30% extends life expectancy by 40 %. What a bonus! So here are the numbers. Given my level of physical activity, I need about 2500 calories a day to maintain my weight. If I follow a CR diet, I would consume only 1750 calories a day (.70 X 2500). Most folks who follow a CR diet, and there are many who do, look like it. One of the articles I read took a closer look at the testing protocol used on the laboratory animals undergoing the CR diet. The author found that lab technicians fed the animals every other day and not daily with a reduced amount. The inference: intermittent fasting also works to extend life. Some evidence has since been developed to support this observation. So I figure I need 17,500 calories a week (7 X 2500) but I take in roughly 12,500 calories (5 X 2500). Thus my weekly reduction in calories is 29% (5000/17,500). Pretty close to the 30%. There is little evidence to suggest at what age animals have to start a CR diet to extend life. Since I am starting so late, I figure the benefits are minor to me. But a 20 year old starting an intermittent fasting routine of two days a week could conceivably extend life to 118 years (84 X 1.40). I have lost body fat and have a waist size of 34. But the mystery to me is that, even with this intermittent fasting routine of twice a week, my vegetarian lifestyle, lifting weights twice a week, running 3-6 miles 4 to 5 days week, I still am carrying a few extra pounds of fat. I look fit, but I do not look skinny. I take this as evidence that the body adapts by altering metabolism to accommodate my eating behavior. 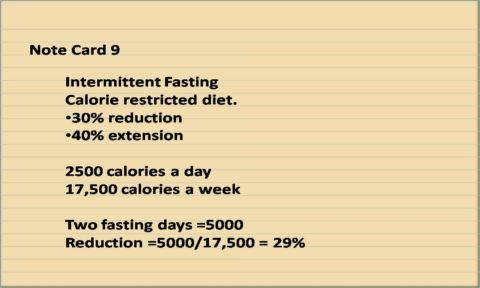 Finally, building on this last observation, which may not stand up to scientific scrutiny, I believe that the life extending benefits of intermittent fasting for a CR diet may be caused by a reduction in base metabolism rates. One way of looking at this is that the wear and tear on our cellular furnaces is reduced and thus our cells can last longer. My goal then is to reduce metabolism and fat at the same time. Several popular diet books make a big deal about increasing metabolism to reduce weight. This appears backward to me.